I first heard about this adorable little café after reading Cloud In A Teacup’s post, and knew that when I next had an opportunity for lunch in Newcastle city centre that this would be at the top of my list. It’s a tiny little place (just behind Barker and Stonehouse, near St James’ Park, on Leazes Crescent) with only a handful of tables, but when we visited on a Tuesday for early lunch it wasn’t too busy and we managed to find seats no problem. I loved the simple décor, the enticing cake counter and the natural light that filled the venue. It was ticking all the boxes for me already. 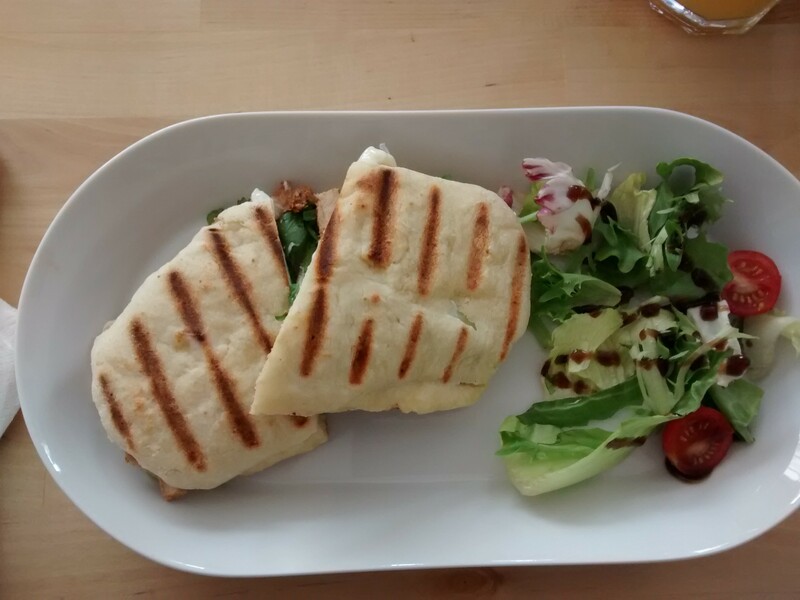 There’s quite a few different options for lunch: flatbreads, soups and salads. MrJ and I both ordered the lemon chicken with rocket flatbreads (£3 each) which were so delicious. You could tell they had been freshly made up for us and the salad with balsamic vinegar dressing was a tasty accompaniment. 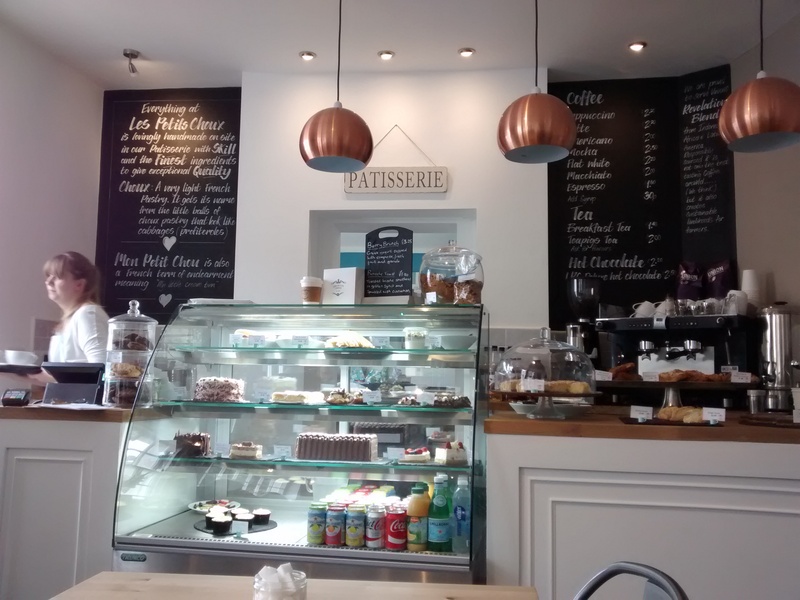 However, what Les Petits Choux really specialise in is patisserie. 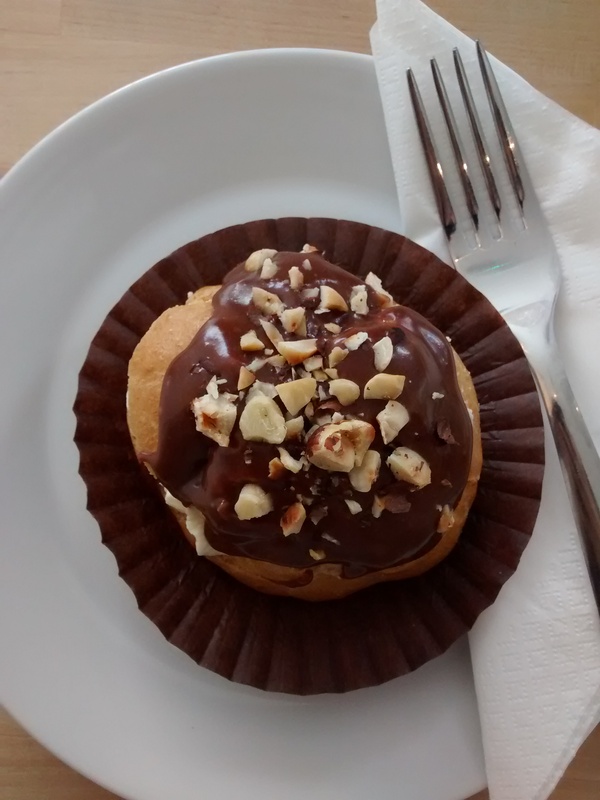 I love choux pastry but apart from the always underwhelming profiteroles that you find on dessert menus in restaurants, there isn’t really much variety on offer (although there is the newly opened Patisserie Valerie on Grainger Street). I’ve made profiteroles myself before and was actually amazed at how easy they were to do (and the amount of versatile fillings you can stuff them with…) Anyway, Les Petits Choux really excel with their choux pastries. I ordered the Ferrero Rocher profiterole while MrJ ordered the salted caramel éclair. I was really impressed with the service as there were no salted caramel éclairs on display in the counter, so one of the staff went into the kitchen to make one up for us. Les Petits Choux can be found at 11 Leazes Cresent, Newcastle.